This genus is accepted, and its native range is Assam to SE. Siberia and Temp. E. Asia, Canada to U.S.A. Annual (3), or perennial (2). Stolons absent (3), or present (2). Culms erect (1/2), or decumbent (1/2); reed-like (2/2); 90-163.7-300 cm long; spongy; rooting from lower nodes (1/1). Ligule an eciliate membrane. Leaf-blades herbaceous (3), or coriaceous (1). Leaf-blade margins cartilaginous (1/1). 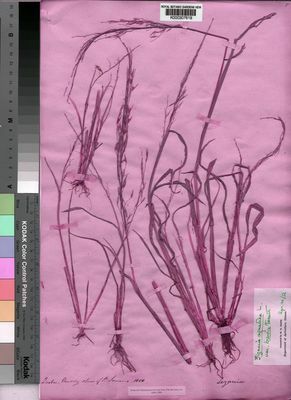 Monoecious; with male and female spikelets in the same inflorescence. Inflorescence a panicle. Panicle open. Sexes segregated; on unisexual branches; with male below. Spikelets appressed (1/1); solitary. Fertile spikelets pedicelled. Male spikelets pedicelled. Pedicels tip cupuliform. Spikelets comprising 1 fertile florets; without rhachilla extension. Spikelets lanceolate (3), or oblong (1); laterally compressed; 8-16.73-33 mm long; falling entire. Fertile florets female. Fertile lemma linear (1), or lanceolate (2), or oblong (2); chartaceous (3), or coriaceous (1); without keel; 3 -veined. Lemma surface smooth (3), or scaberulous (2). Lemma margins flat (1), or interlocking with palea margins (3). Lemma apex acute (1), or acuminate (3); awned; 1 -awned. Palea 1 length of lemma; 2 -veined (1), or 3 -veined (3); without keels. Caryopsis with adherent pericarp; linear (3/3). Male spikelets distinct from female; linear (3/3). Male spikelet glumes absent. Male spikelet lemma muticous (3), or awned (2). Spikelets comprising 1 fertile florets; without rhachilla extension. Spikelets lanceolate (3), or oblong (1); laterally compressed; 8-16.73-33 mm long; falling entire. Male spikelets distinct from female; linear (3/3). Male spikelet glumes absent. Male spikelet lemma muticous (3), or awned (2). Europe (2), or Temperate Asia (2), or Tropical Asia (1), or Australasia (1), or Pacific (1), or North America (3). Annual (1), or perennial (244). Rhizomes absent (199), or short (31), or elongated (21). 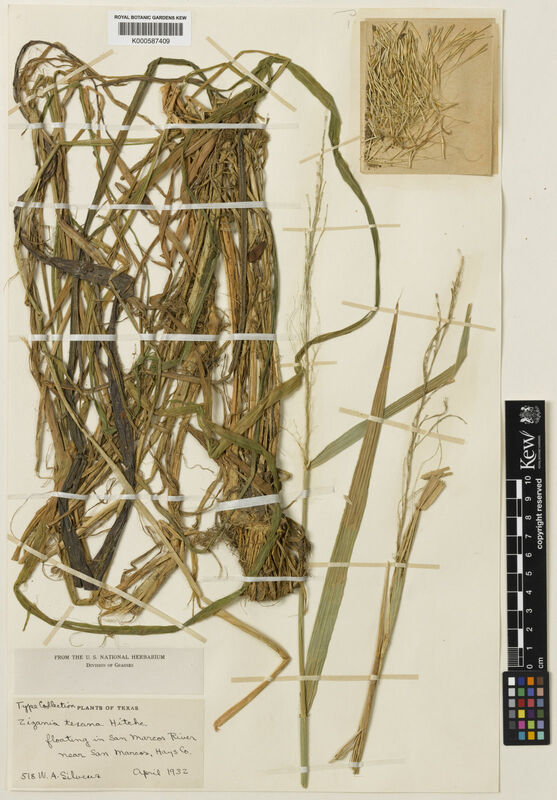 Stolons absent (243), or present (2). 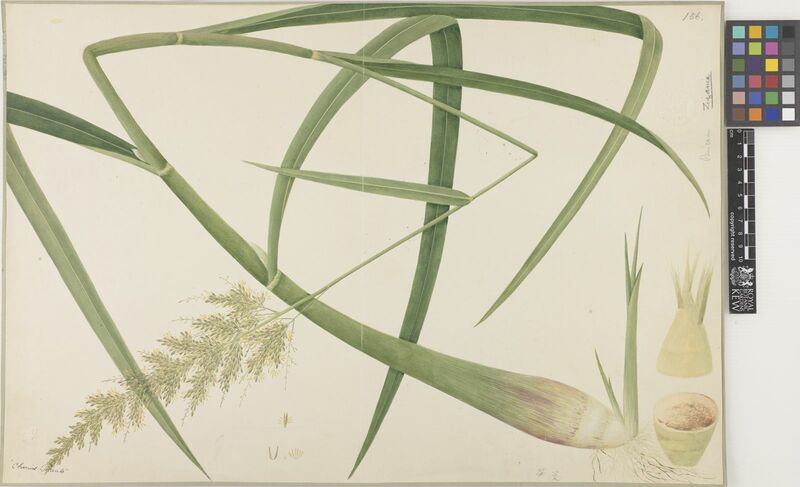 Culms erect (142/172), or geniculately ascending (86/172), or decumbent (8/172), or prostrate (2/172); robust (3/15), or slender (10/15), or weak (2/15); 10-66.6-208 cm long; rooting from lower nodes (2/2). Culm-nodes constricted (2/2). Lateral branches lacking (5/5). Leaf-sheaths tubular for much of their length (1/1). Leaf-sheath auricles absent (182), or falcate (72). Ligule an eciliate membrane (242), or a ciliolate membrane (2), or absent (3). Leaf-blades aciculate (2), or filiform (8), or linear (235), or lanceolate (3); herbaceous (241), or coriaceous (4); stiff (32), or firm (211), or flaccid (4); without exudate (244), or pruinose (1). Leaf-blade margins unthickened (2/5), or cartilaginous (3/5). Leaf-blade apex muticous (239), or pungent (6). Inflorescence composed of racemes; exserted (242), or embraced at base by subtending leaf (6). Racemes single; erect (30), or ascending (188), or drooping (37), or deflexed (2); linear (239), or moniliform (1), or oblong (7), or ovate (2), or obovate (1); unilateral (2), or bilateral (244); bearing few fertile spikelets (7), or many spikelets (238); bearing 1-9-25 fertile spikelets on each. Rhachis tough (239), or fragile at the nodes (6); flattened (203/207), or angular (1/207), or semiterete (4/207); terminating in a spikelet, or sterile spikelet (1). Spikelet packing broadside to rhachis; crowded (19), or contiguous (160), or lax (64), or distant (4); 2 -rowed (44/44). Rhachis internodes indefinite (116), or linear (117), or oblong (11), or clavate (1); falling with spikelet above (6/6). Rhachis internode tip flat (54/54). Spikelets appressed (27/37), or ascending (5/37), or spreading (5/37), or pectinate (2/37), or deflexed (1/37); solitary (212), or in pairs (42), or in threes (2), or clustered at each node (2). Fertile spikelets sessile (243), or sessile and pedicelled (2), or pedicelled (11); 1 in the cluster (2/11), or 2 in the cluster (11/11), or 3 in the cluster (5/11), or 4 in the cluster (3/11). Pedicels oblong (4/4). Basal sterile spikelets absent (242), or rudimentary (3), or well-developed (2). Spikelets comprising 0-1 basal sterile florets (2/2); 1-5-20 fertile florets; with a barren rhachilla extension (3), or with diminished florets at the apex (242). Spikelets linear (2/222), or lanceolate (24/222), or elliptic (175/222), or oblong (188/222), or ovate (4/222), or rhomboid (1/222), or cuneate (6/222); laterally compressed (239), or dorsally compressed (6); 5-15.78-80 mm long; falling entire (10), or breaking up at maturity (236); deciduous from the base (8/10), or with accessory branch structures (2/10); disarticulating below each fertile floret (229/236), or between fertile florets but the lowest falling with glumes attached (1/236), or above glumes but not between florets (6/236). Spikelet callus glabrous (9/10), or bearded (1/10); base truncate (26/27), or acute (1/27). Rhachilla internodes glabrous (140/244), or sparsely hairy (8/244), or pubescent (86/244), or pilose (11/244). Floret callus brief (241), or evident (4); glabrous (7/64), or sparsely hairy (1/64), or pubescent (43/64), or pilose (10/64), or bearded (4/64); obtuse (244), or acute (1). Basal sterile spikelets absent (242), or rudimentary (3), or well-developed (2). Spikelets comprising 0-1 basal sterile florets (2/2); 1-5-20 fertile florets; with a barren rhachilla extension (3), or with diminished florets at the apex (242). Spikelets linear (2/222), or lanceolate (24/222), or elliptic (175/222), or oblong (188/222), or ovate (4/222), or rhomboid (1/222), or cuneate (6/222); laterally compressed (239), or dorsally compressed (6); 5-15.78-80 mm long; falling entire (10), or breaking up at maturity (236); deciduous from the base (8/10), or with accessory branch structures (2/10); disarticulating below each fertile floret (229/236), or between fertile florets but the lowest falling with glumes attached (1/236), or above glumes but not between florets (6/236). Spikelet callus glabrous (9/10), or bearded (1/10); base truncate (26/27), or acute (1/27). Rhachilla internodes glabrous (140/244), or sparsely hairy (8/244), or pubescent (86/244), or pilose (11/244). Floret callus brief (241), or evident (4); glabrous (7/64), or sparsely hairy (1/64), or pubescent (43/64), or pilose (10/64), or bearded (4/64); obtuse (244), or acute (1). 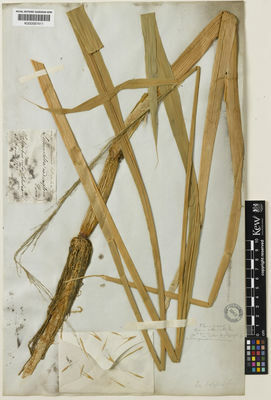 Glumes both absent or obscure (2), or two; distichous (195), or lateral (1), or collateral (49); persistent (219/220), or deciduous (1/220); shorter than spikelet (199/208), or reaching apex of florets (6/208), or exceeding apex of florets (4/208); parallel to lemmas (243), or gaping (2). Lower glume subulate (8), or linear (12), or lanceolate (180), or elliptic (24), or oblong (60), or ovate (8), or obovate (2); not gibbous (243), or gibbous (2); 0.5-0.9353-1.25 length of upper glume; membranous (5/239), or chartaceous (1/239), or herbaceous (1/239), or coriaceous (232/239); without keels (220/235), or 1-keeled (15/235); 0-4-11 -veined. Lower glume lateral veins absent (14), or obscure (7), or distinct (221), or prominent (11); without ribs (187/239), or ribbed (52/239). Lower glume surface smooth (153), or asperulous (20), or scabrous (86); glabrous (223), or puberulous (4), or pubescent (11), or pilose (10), or hirsute (3), or villous (1), or hispidulous (2). Lower glume apex entire (236), or erose (2), or with a unilateral tooth (15), or dentate (8), or lobed (1); 1 -fid (3/9), or 2 -fid (8/9), or 3 -fid (2/9), or 4-9 -fid (1/9); emarginate (2/230), or truncate (8/230), or obtuse (21/230), or acute (107/230), or acuminate (103/230), or attenuate (12/230), or setaceously attenuate (17/230); muticous (166/237), or mucronate (39/237), or awned (77/237). Upper glume subulate (8), or linear (9), or lanceolate (177), or elliptic (25), or oblong (66), or ovate (7), or obovate (2); not gibbous (243), or gibbous (2); 0.25-0.9061-9 length of adjacent fertile lemma; membranous (5/239), or chartaceous (1/239), or herbaceous (1/239), or coriaceous (232/239); with undifferentiated margins (197), or hyaline margins (12), or membranous margins (28), or scarious margins (9); without keels (220/235), or 1-keeled (15/235); 0-4-11 -veined. Upper glume primary vein eciliate (244), or ciliate (1). Upper glume lateral veins without ribs (189/242), or ribbed (53/242). Upper glume surface smooth (154), or asperulous (21), or scabrous (84); glabrous (225), or puberulous (5), or pubescent (8), or pilose (10), or hirsute (3), or villous (1), or hispidulous (2). Upper glume apex entire (236), or erose (2), or with a unilateral tooth (16), or dentate (7); 1 -fid (3/7), or 2 -fid (6/7), or 3 -fid (2/7), or 4-9 -fid (1/7); emarginate (3/232), or truncate (8/232), or obtuse (20/232), or acute (106/232), or acuminate (106/232), or attenuate (12/232), or setaceously attenuate (16/232); muticous (163/237), or mucronate (36/237), or awned (81/237); 1 -awned (79/80), or 3-9 -awned (1/80). Basal sterile florets barren (2/2); without significant palea (2/2). Lemma of lower sterile floret subulate (1/2), or linear (1/2), or oblong (1/2); coriaceous (1/1); awned (1/1). Fertile lemma lanceolate (181), or elliptic (70), or oblong (107), or ovate (5); chartaceous (3), or coriaceous (242); of similar consistency on margins (238), or much thinner on margins (7); without keel (45/90), or keeled (45/90); 3-4 -veined (3/236), or 5 -veined (235/236), or 6 -veined (23/236), or 7 -veined (24/236), or 8-11 -veined (1/236). Lemma midvein without distinctive roughness (242), or scaberulous (2), or scabrous (1). Lemma lateral veins obscure (7/12), or distinct (2/12), or prominent (3/12); without ribs (238), or ribbed (7). Lemma surface smooth (177), or asperulous (4), or scaberulous (37), or scabrous (42), or papillose (1); glabrous (161), or puberulous (31), or pubescent (43), or pilose (20), or hirsute (4), or villous (8), or hispidulous (6); hairy on back (107/110), or on veins (2/110), or between veins (1/110). Lemma margins eciliate (223), or ciliolate (6), or ciliate (10), or pubescent (10), or villous (1). Lemma apex entire (231), or dentate (17); 1 -fid (2/17), or 2 -fid (15/17), or 3 -fid (2/17); emarginate (9/207), or truncate (4/207), or obtuse (17/207), or acute (134/207), or acuminate (49/207), or attenuate (7/207), or setaceously attenuate (1/207), or apiculate (1/207); muticous (42), or mucronate (20), or awned (208); 1 -awned (207/209), or 3 -awned (2/209). Principal lemma awn apical (213/223), or from a sinus (12/223); straight (176/223), or curved (63/223), or flexuous (8/223); 0.9-1-1.1 length of lemma; limb glabrous (222/223), or puberulous (1/223). Lateral lemma awns shorter than principal (1/1). Palea 0.66-0.9797-1.1 length of lemma; membranous (243), or coriaceous (2); 2 -veined (78/78). Palea keels separated (244), or approximate (1); wingless (239), or winged (6); smooth (181), or scaberulous (7), or scabrous (58), or tuberculate (1); eciliate (136), or ciliolate (85), or ciliate (24). Palea surface glabrous (198), or puberulous (33), or pubescent (13), or pilose (3), or hirsute (1). Palea apex dentate (5/5); muticous (244), or with excurrent keel veins (2). Apical sterile florets resembling fertile though underdeveloped (240/242), or distinct from fertile (2/242); rudimentary (1/1). Lodicules 2 (179/179); membranous (176/176); glabrous (173/179), or ciliate (6/179); 2-toothed (1/1). Anthers 3 (233/233). Stigmas 2 (176/176). Ovary unappendaged (242), or with a fleshy appendage below style insertion (3); pubescent on apex (159/159). Caryopsis with adherent pericarp (198/198); linear (1/21), or lanceolate (2/21), or fusiform (4/21), or ellipsoid (1/21), or oblong (11/21), or obovoid (3/21); isodiametric (4/4); smooth (4/4); apex unappendaged (26/26). Embryo 0.15-0.1955-0.25 length of caryopsis. Hilum linear (49/49); 0.9-0.9429-1 length of caryopsis. Europe (25), or Africa (9), or Temperate Asia (176), or Tropical Asia (31), or Australasia (16), or Pacific (1), or North America (40), or South America (11), or Antarctica (2).